Fitzrovia News number 140, Spring 2016. Published Tuesday 1 March 2016. 20 pages of news, features, reviews, comment, literature and listings. 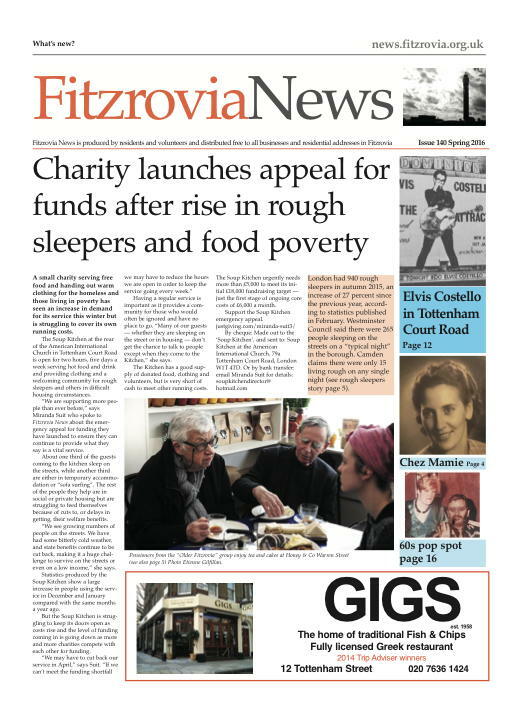 Download the full paper as a pdf here Fitzrovia-News-FN140-lowres. Download centre pages as a pdf here Fitzrovia-News-FN140-centre-pages-lowres. Fitzrovia Community Centre, 2 Foley Street, London W1W 6DL. Fitzrovia Bicycles, 136-138 New Cavendish St, London W1W 6YD. This entry was posted in Fitzrovia News and tagged community newspaper, Fitzrovia, hyperlocal, London. Bookmark the permalink.